Tollef Olson, president of Ocean's Balance harvests for kelp in Casco Bay. 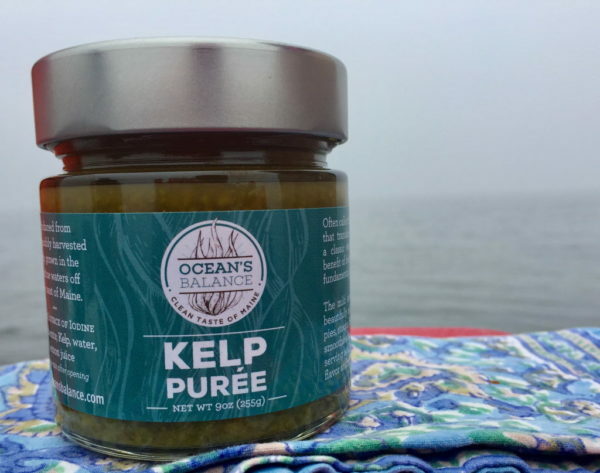 Kelp puree is a new taste of Maine from startup Ocean's Balance. It's been on the market since January. The team at Ocean's Balance with their kelp puree. From Left is CEO Mitchell Lench, president Tollef Olson and head of sales and marketing Lisa Scali. CASCO BAY, Maine — On a gray day in South Portland, Tollef Olson points his skiff into the fog, rain and wind. Plowing through the swells past Bug Light, he cuts the engine as a cluster of white buoys come into view. Hardy and rugged, the aquaculture entrepreneur drops anchor somewhere off Cow Island. He doesn’t cast a fishing rod, or pull in a trap. Instead the 61-year-old hoists a submerged line, and long, brown sheets of seaweed emerge. Tearing off a section, Olson offers a taste of sugar kelp to his partners in Portland’s latest food startup, Ocean’s Balance. Founded last year by Olson and Mitchell Lench, the company’s newest product is a kelp puree. When most people think of kelp, they don’t reach for a jar. And that just might be Ocean’s Balance genius. 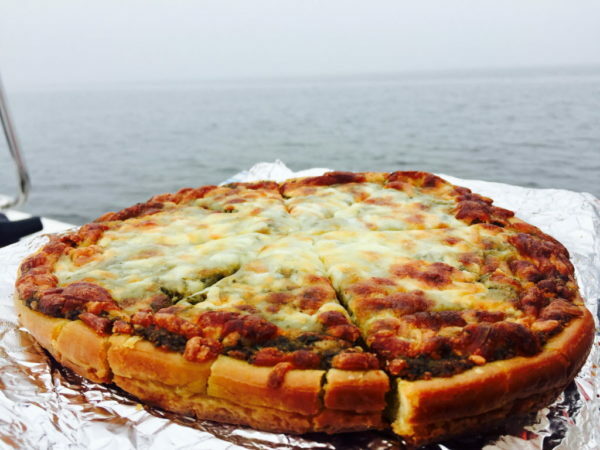 “One of the goals of our company is to introduce kelp into the American cuisine, so people don’t have to change their diet,” said Olson, who cultivates kelp plants in up to 1,800 square feet of leased portions of Casco and Saco bays. As founder of Bangs Island Mussels and Ocean Approved, two businesses he has sold, Olson is reinventing the kelp experience and hopes to turn this superfood into your condiment of choice. This sustainable, untapped food source has endless potential. Not only is kelp farming a low- barrier to entry fishery with minimal overhead, the world’s food supply just may depend on sea vegetables. Plus it might save the planet. The Food and Agriculture Organization of the United Nations reports that by 2050 feeding the world’s 9 billion population with current land-based farm models is an environmental and socioeconomic risk. The future of agriculture lies in improving and investing in natural resources, like kelp farming, researchers say. As director of the Center for Venture Research of Seafood Solutions at Bigelow, Price sees kelp as a potent solution to marine threats like ocean acidification caused by increasing carbon levels. Sugar kelp, which is what Ocean’s Balance is growing, is at the top of the list for removing carbon dioxide from the ocean when it is harvested. “It surprised us. There are other species of seaweed, but kelp is absorbing enough carbon dioxide that it will have significant impact to restore water quality, and every year sugar kelp farming is increasing,” said Price. Kelp may be the new superfood, but like kale and acai berries, it’s been around for centuries. To combat food insecurity, visionaries like Olson are stepping in with solutions. “We are way out of balance for food and have to adjust our practices,” said Olson. Eight years ago there was only one kelp farm in the country and it was in Maine. 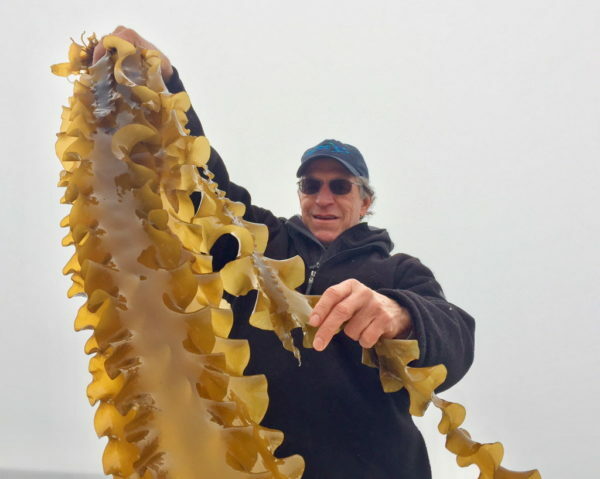 Now there are kelp farms in Alaska, California and “at least a half dozen kelp farms in operation, with at least six more pending in Maine,” said Price. Price is involved in a multi-phased study, and hopes to partner with Ocean’s Balance to expand her work on kelp’s so-called “halo effect,” which examines seaweed’s proximity to shellfish, to help mitigate ocean acidification impacts on shell growth and quality. She calls kelp a gateway into aquaculture because it only takes six months to bloom. By comparison shellfish aquaculture takes two to-five years, and fish aquaculture takes even longer, said Price. One of the barriers to the kelp industry is the American palate, how willing people are to add algae into their diet. That’s where Ocean’s Balance puree comes in. Sold like a jar of salsa, the puree made in Portland is easy to add to smoothies, pesto sauces, soups and even fudge. 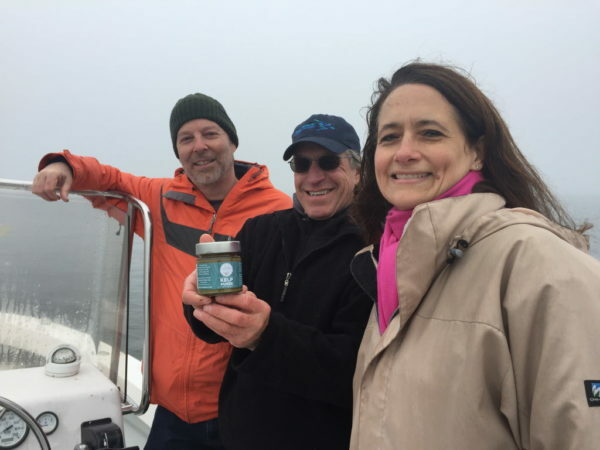 Taking a fortifying sip of kelp-infused roasted tomato soup, prepared by Ocean’s Balance head of sales and marketing Lisa Scali, Olson comments on the briny punch of kelp as a catalyst for flavors and nutrition. “The kelp adds a wonderful umami pop. The potassium in the kelp, unlike [heavy doses of] sodium, is good for you. It’s a great way to increase your calcium intake while still getting the salt that your body requires,” says Olson. Kelp puree can also be used on eggs, in smoothies and even pizza. Scali, who has been giving shoppers at places like Lois’ Natural Marketplace in Portland tastes of polenta pizza and fudge (all made with kelp) regularly, is hooked. “I love how easy it is to use, which is another way of saying how versatile it is. It can literally be added to anything you’re cooking, soups, stews, sauces, pestos, dips, mayos, pasta, breads, smoothies, cakes, cookies and fudge. I don’t have to change the way I cook in order to include a nice dose of healthy to my meals,” said Scali. Available in shops in greater Portland and New Hampshire, the puree is being introduced on university campuses in Maine, where college students are hip to kelp’s environmental benefits.